生きる,愛, オタク ❤: About Me! If you could only chose 5 photos to describe yourself what would you chose? For my photos I decided to choose some of my hobbies and interests. I love photography and the first picture is a picture of my "baby" my first camera not attached to a cellphone. Below is an internet photo of the one place that inspires me the most. . . Japan! I love the language and its culture and hope to study there some day. 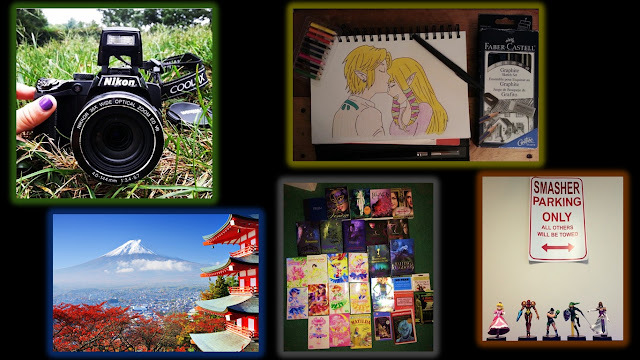 Japan has influenced other hobbies of mine such as drawing, gaming, and reading. I love to read Japanese Manga (comic books) and playing Japanese video games (basically anything Nintendo). However, I also enjoy reading in general. So, that's the basic ingredients into making me who I am!